I think it must be my age but last year seemed to go extremely fast! Thank you so much to those of you who responded to our ‘pep talk’ in the December blog. It seems we hit on just the right note for some of you and I hope encouraged the spirit of optimism we intended. Remember ‘when the going gets tough, the tough get going’! I have not really been taking my own medicine during December as I have given myself a month off work for a much needed holiday and the Christmas celebrations. Before we left on December 5th I fitted in a trip to London to meet my Voice Care Network colleague, Phil Bliss, who is very active in voice coaching in the capital and Norway. I am looking forward to some collaborations in the future. December saw my first attendance at a meeting of the Institute of Directors. This was part social, part business and held at T.M. Lewin’s shirt company in the new Highcross Centre, Leicester. Over a glass of wine and nibbles I renewed old business acquaintances and made some interesting new ones. I am looking forward to attending many events next year. My next theatre visit was to see ’84 Charing Cross Road’ at the Concordia Theatre, Hinckley. This play explores the real life relationship between an American authoress and an antiquarian bookseller in London between the late 40’s and the 1970’s. The leading performances were excellent and I would recommend the play (and film) to any of you who have not seen it. I got my own Christmas performances off to a start with some readings at a Ladies Luncheon Club in Hinckley. Then it was off to a fortnight in the sun….. which is where the interesting photo this month comes in! These two fellows are Mona Monkeys. They live on the island of Grenada where they have become opportunists….as you shall hear. We were on a mini-bus tour up in to the interior of the island which is lush rainforest when our driver stopped off at a roadside stall to buy some bananas. Were they his lunch we wondered? Well, no, they were for something much more specific! 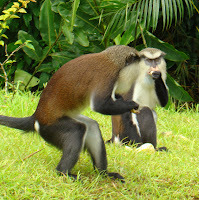 When we arrived at the national park our driver suggested we follow him and as he approached a grove of trees out popped these two monkeys who happily took the bananas from his hands. There were several other buses there but none had a ‘close encounter’ like us. The monkeys had learnt that this particular driver would arrive most days at a set time and would feed them if they posed for the cameras – so they happily sat and let us get quite close for a minute or two then they disappeared back into the rainforest. They were prepared to fraternise with the enemy (i.e. humans) for a worthwhile reward but they remained independent and wild and chose whether to appear and ‘perform’ or not. So, let us use that as this month’s business tip. Look for new opportunities and possibilities. Don’t wait for things to land in your lap. Be prepared to go out and try something new. Throw caution to the wind and put yourself on the line. Let people know you are there and what you can offer. Get NETWORKING at every opportunity whether you are an early riser (breakfast) or a mid-day person (lunch) or you prefer early evening after work. There are lots of opportunities and people can’t do business with you if they don’t know you are there. I have personally found BNC (www.businessnetworkingclubs.co.uk) particularly helpful but I know that BNI (www.bni.co.uk) and ‘The Business Club’ (www.the-businessclub.org) are also highly thought of by members. Business women may like to look at WiM (www.managers.org.uk) of which I am a member or WiBN (www.wibn.co.uk) which has many branches in the Midlands and beyond. All of these organisations will make you very welcome and help you to increase your business contacts – GOOD LUCK! On the day I got back from the Caribbean I was performing again (I’m a glutten for punishment!). I presented an evening of Festive Readings with 3 acting friends in the bar at the Concordia Theatre. £150 was raised for the development fund and the mulled wine and mince pies were devoured with glee. Remember that I am available for speaking and perfoming (my one-woman show) anywhere so give me a call. I told you last month that I would give you further information about my new Team Building course. It occurred to me that my professional training as an actress was something that I should use more in my business work so I intend to create an interesting day by using scenarios and texts from Shakespeare and other playwrights to build team awareness and leadership. No performance skills will be needed but there will be challenging problems to solve and a great deal of fun as delegates use techniques created by Shakespeare for his actors over 400 years ago to produce modern story lines and perform their devised pieces under the guidance of their leader/director. I am very excited by the prospect this new course offers and hope to have the opportunity to try it out very soon. So, what does 2009 have in store for me? Well, I am very optimistic with workshops for the Leicester NHS, Birmingham City Council, the ASA in Preston and Conway already in the diary together with a seminar for the Erewash Partnership’s women’s event in Long Eaton and speaking engagements at Probus (Leicester), Switched-on-Biz at Solihull and Women in Management (Leicester). Then I have my ‘Voice Matters!’ public booking workshops on February 4th (still I place left!) and March 11th (note change of date). These are at the Marriott Hotel, Leicester (adjacent to junction 21 of the M1) and details can be found on my website: www.loudandclearuk.com/Voice-Workshops.aspx. I am also looking at delivering my first public workshop in Warwickshire – would you be interested? Next will be my first ‘Dynamic Speaking’ 2 day course. Provisional dates are May 13th & 14th. This will include filming before and after and will only be available for 8 delegates (ideally they will have attended a ‘Voice Matters’ session and have the basic vocal knowledge). Again, please let us know ASAP if you are interested. So, let’s get out there and do some business! All the best. See you in February and remember: Speak Wisely, Speak well, Speak Loud & Clear!